The Waterville Area Chamber of Commerce is hosting the 46th Annual Roche de Boeuf Festival on Saturday, September 28 from 9 a.m. to 5 p.m. in downtown Waterville. 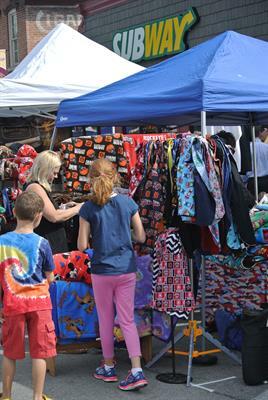 The festival features a variety of activities for all ages and free entertainment throughout the day. Waterville’s downtown streets will be filled with crafters, food vendors, area artists, as well as booths staffed by area businesses and non-profit organizations. Three stages of free entertainment will highlight an array of local performers . Along with the great performers, there will be many activities for children. Children’s activities include carnival rides, a train ride, inflatable’s, face painting, pitching machines, pony rides and euro-bungee. Festival attendees can also enjoy observing many activities of the past in the Pioneer Arts Area, which features numerous pioneer artisan stations and historic reenactments including: basket and chair caning, beekeeping, blacksmithing, butter churning, corn shelling, Indian trading, storytelling, quilting, rug weaving, rope making, spinning, weaving, and woodcarving. The Waterville Historical Museums along River Road will also be open for tours. The Annual Roche de Boeuf Car Show will be held in the Shawn’s Irish Tavern Parking Lot throughout the day, with registration beginning at 8 a.m. and an awards ceremony at 3 p.m. Car show categories include: pre-1950, 1950s, 1960s, 1970s, 1980 to present, Corvettes, European cars, Asian cars, and Trucks/4X4s. Over thirty trophies will be awarded, including nine for “Best in Class”, fifteen for “Award of Excellence”, as well as several “People’s Choice Awards.” In addition, dash plaques will be presented to the first 100 registered cars. Participants will also have chances to win door prizes throughout the day. The Car Show Registration fee is $10. Car Show registration forms are available on the Waterville Area Chamber of Commerce website at www.watervillechamber.com.